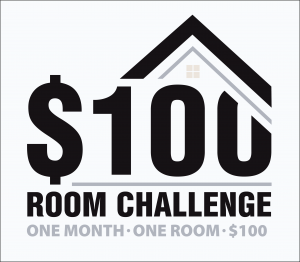 Welcome to Week 3 of the $100 Room Challenge, this week we will focus on a DIY project. We will be adding a barn wood facia board to the front of all the existing wire shelves. This will cover and replace the ugly wire shelve and give me that upscale cohesive look that I desire. If you are just joining this post, I will give you a quick recap: This challenge takes place twice a year. January and September is when Erin invites us to redo a room in our home using only $100. As you can see the premise of this challenge is real simple: one month, one space, and $100. 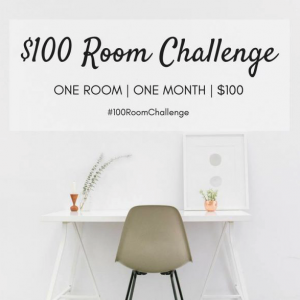 If you want to know more about the $100 Room Challenge, check out Erin’s post to see how the concept was inspired, and it’s colossal growth since she decided to start it. Last week we removed all the previously housed linens, textiles, and pillows from the closet. We purged and donated anything that was no longer able to work in these two rooms. Which included mis-matched sheets, items that were not being used, and towels that were no longer at their freshest. Now that the closet is empty, it is time to add the barn wood facia boards. The barn wood facia boards we are using for the linen closet, are the exact same ones that we used on our fireplace mantle and drop zone area. If you get a chance, you really should check them out if you have the time. I got to say they both turned out really great. Since we have already purchased these boards in a 6 pack from Home Depot , we lucked out and only needed one 8 foot board for all of these shelves. Since the existing wire shelves are 24″ long, we were able to cut all four facia boards out of one piece, of the 8 foot board. This works out to $8.37. 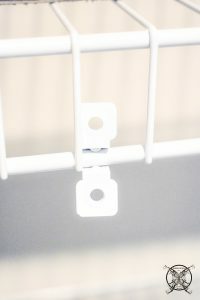 Next we used some wire shelf brackets ($4.36 for 12) to affix the facia board to the racks. We decided that 3 brackets per shelf would be fine since they are pretty light facia boards. 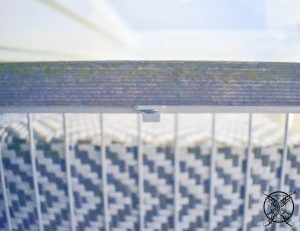 Plus, the fit between the wall and new facia boards was actually snug enough to hold with out any brackets, but just for safety sake we wanted to make sure they were firmly attached. The picture below gives you an idea of how the brackets attached to the facia boards. Yes, you do have to install them from inside the closet, on your back, but the look is so worth it!!! 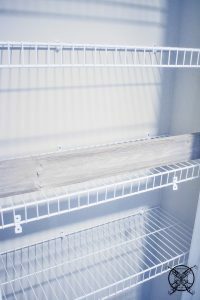 The best part we were able to create these faux wooden shelves for a whopping $12.73, can you believe that? I have decided to hold the finished pictures for next week, so you can get a big final reveal, but you can check out the first rendition of this type of project in our Pet Room Closet Conversion. I know it is kind of mean that I am holding the final reveal pictures, but if you notice above, you can see a sneak peak at the baskets I have chosen. I got these for a total steal, a 3 pc set of nesting baskets at my local HomeGoods for $30. So at this point my all in total is at $42.73. I will probably have room left in the budget to get some fresh towels and other fun goodies to go inside too. I am so excited that it is all really coming together! Want to see even more transformations? Check out below for even more ideas of what you can do with $100 from these amazing group of bloggers! An interesting discussion and I think that you must write more on this subject since this type of decor is so popular. We are really enjoying this post about your Linen closet upgrade. Inspired to the hilt by this particular challenge, $100 is more my speed. Simply wish to say your article is as amazing. The clarity of your writing and commitment you submit to your readers is just very cool. So I think you are an expert on this subject and blogging in general. Thanks a million and please continue the gratifying work. You really make it seem so easy with your presentation. It does not seem too complicated to me. I am looking forward for your next post, I will try to get the hang of it for my own closet! Pretty selection of content so far. I am so impressed with the way you created the faux shelves for this closet such a game changer. 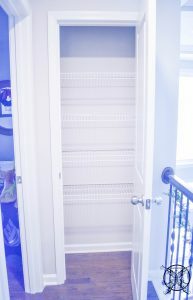 I would have never thought to have done this to wire closet shelves, such a great idea to dress them up. Wow that is all I can say…………what a great idea. That is all I got. My mind is still spinning. I wish you could come design my home. It is in desperate need of your advice. Can I just say what a great idea this is……I mean how do you come up with this stuff. You are truly a very creative soul. This is great idea, I may have to add some facia boards to my cooling racks that are visible in my bakery kitchen from the store. It would really dress up those wire racks for sure. Thanks for the great idea. Oh I really love this idea, and the beautiful wood makes it. Gorgeous! There is clearly a bunch to know about this type of design. You made sure good factors in features also. Nice post.thank you for sharing. Aw, this was a really nice post. A concept I would like to do in my own home. I simply needed to thank you very much yet again. Spending my time reading the skilled avenue you provided filled me up with so much fulfillment. I am just happy for your service and then hope that you recognize what a great job you are undertaking educating most people using your webblog. I recently discovered your blog site and have perused a number of your posts. Got to say I want more, to read from your so I added your RSS feed to my MSN Information Reader. I am so impressed,with what you were able to accomplish and still stay in the $100 budget. This is a budget saving idea for sure. Thanks for the fresh and new content. Oh my I love this idea. It looks great and so very affordable. A quality blog brings quality and changes mind of many intellects. You may be interested to know how you are contributing to the design world and bringing your ideas to the forefront. Oh my goodness what an incredible post. I think that added wood looks great. Thank you and I want to subscribe to your blog, please add me in. Thank you so much for giving us this fantastic idea for our own closet. This is really a budget friendly way to make it look pretty. You made something out of nothing here. I looked on the internet for solutions to wire shelving problems and most individuals will associate solutions with your website. I really respect this post and that you are doing a budget restricting challenge. I’m going to bookmark your website and preserve checking for brand spanking new information. I would like to convey my love for your creativity you really do amaze me! I bet you mind is always going 24/7. Wow, very nice way to put up that barn wood and carry it into the rest of your home. I also wanted to tell you that I actually love this web site! After study a few of the weblog posts in your website now, and I actually like your means of blogging. I bookmarked it to my bookmark web site listing and shall be checking again soon. Pls take a look at my site as properly and let me know what you think. I really really really LOVE this idea. I am so jealous of how pretty your linen closet is, and I must replicate it in my own. You are so very cool! You know how I like cheap! This is perfect! Please keeping doing more of these challenges. Gloria, I could not agree with your more. We all need to celebrate each other and support those of us in the same field. 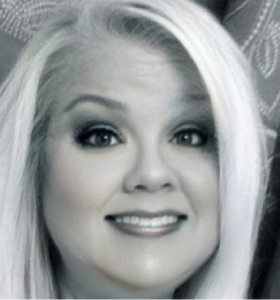 I am very familiar with your work over the years and I am humbly honored that your follow my little blog. Thank you so much for all the support and encouragement. I needed to see this post. You have such innovative ideas that inspire me so much. As a fellow designer sometimes we need that inspiration and we can feed off each others ideas. This is why I love the home decor blog family so much. This post really answered my linen closet problem. I also, really hate those ugly wire shelves but just don’t have the money to put forth into redoing all the shelves. Thank you! There is so much to learn from you and these wonderfully creative ideas. I love that barn wood board you added it really improves the visual appear of this closet. LOVE IT! This is a really great idea and so simple to add on to wire shelves. 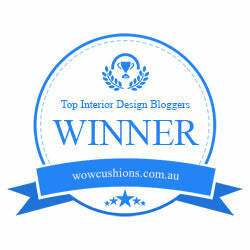 You should participate in a contest for one of the best blogs on the web. I’ll suggest this web site and will totally vote for you. Great site and very inspiring. 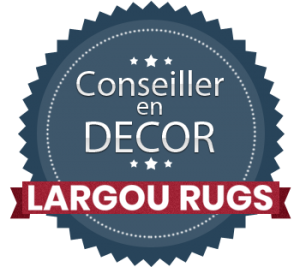 Thanks so much for providing such a nice possibilities in decor to read in detail from here. It is always very good and packed with fun ideas for me. I am impressed, you kept with in a $100 budget. I have to say that would be very hard for me. Your thought process to do this of linen closet is excellent! Thanks for all of your hard work on this blog. We wanted to take a moment to congratulation you on such a effective and useful post. You always inspired me to think outside the box like you do. 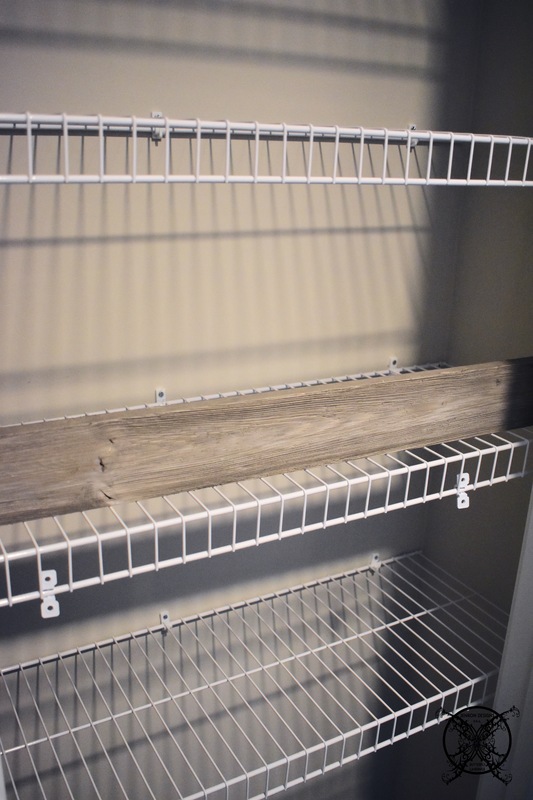 I love the idea of adding a facia board to wire shelving, so inexpensive and the reveal is beautiful. I am writing to make you know how fabulous my experience at your blog has been. I am enjoying this challenge and so happy you have it all linked together for easy reading. You have many good ideas and information to share, we can all learn something from you. You need to participate in a for real contest, with prizes, because this is such a great idea. I would nominate you for one of the best blogs on the web. In fact I’ll recommend this site to everyone I know! Great job! You have a great blog right here! I love that you are doing design in all price ranges. Even though your were on a tight budget nothing about it looks cheap at all. Thank You. You realize so much of what you do is just enlighten those of us with your wisdom and vision. It is all really nice stuff, just a great blog all the ay around! I definitely wanted to send a brief word in order to thank you for these great items you are writing on this site. Your step by step DIY is incredible! Thanks again for all the details, I cannot wait to try it. Your home is projects are so valuable for me. I really like this one such a fanatic look fro little to no money. Thanks for always sharing such great advice and ideas. Thanks so much for doing this challenge. I always love to see of the these ideas that the contestants come up with for $100. You are doing a excellent job so far, can not wait for the reveal. I love how enthusiastic you are about interior design. You passion clearly comes through in all your posts. 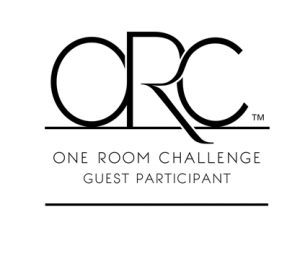 I particularly like the $100 Room challenge as it is so affordable for your readers. You really surpassed our own expectations. Thank you for rendering such affordable advice and decor knowledge. Most designer I know just want to make a quick buck, but you put it all out here free for the reading. This information is truly valuable for me. I love that you kept such a shoestring budget and still made your space beautiful. Thank you for all you do. Would you be interested by exchanging links? I love your posts. I enjoy you blog because you are always thinking outside for the box. It is also clear that you love doing these project by all of your own hard work on this site. You’re doing a great job and truly carrying out a very cool dream. Very nice article you put up, I definitely love this web site, keep on it you have gold! Thank you for all the pieces and details to recreate this closet. I love the way it looks and aspire to make mine look very similar. There’s noticeably a bundle to learn about adding facia boards to wire shelves and proper storage techniques.You made sure nice points and have given us a lot of options also. Great post love the $100 challenge. What a wonderful post. Thanks for the share..I have to say that I want to see more of these types of challenges. I simply had to say I love this challenge. I can do $100 easier than some of the bigger ones. Thanks once more for a entertaining and informative post. I found your blog site on google and checked out a few of your early posts. Love them!Continue to maintain up the excellent operate. I just added your RSS feed to my MSN News Reader. Looking forward to reading more from you later on! Spot on with this write-up, I really think this web site wants rather more consideration. I will be back again to learn rather more, thanks for that info. I obtained a great deal of information, from this piece of writing. You have such great techniques on your web site. What an awesome idea! I may have to use that one!! Looking forward to seeing the finished space! Such a great idea to update wire shelving. Cannot wait to see this whole closet all finished up! The suspense is killing me! Can’t wait to see the reveal! What a great idea, and so affordable! This will really change the look of the closet! Wow that’s so cool. I didn’t know you could attach wood to the shelves like that. I can’t wait to see the reveal! This is an ingenious idea, Jennifer! I just love the look and the cost can not be beat. Very clever, oh can’t wait to see the finished closet now!! What a great idea! I can’t wait to see how they turned out! That wood is lovely! Can’t wait to see your beautiful linen closet! Thank you Patti, i am very very excited to show the reveal. I think mine will be next week since I am pretty much done at this point. I have notice a few people are taking the extra week which makes sense but I was really stretching a Linen Closet to 4 weeks LOL. You basket choice sounds super pretty. Looking forward to your reveal.